Laser treatment is an acronym us for LIGHT AMPLIFICATION BY STIMULATED EMISSION OF RADIATION. stimulated emission is made possible through an understanding of spontaneous emission and the quantum mechanics of matter atoms consist of a nucleus surrounded by orbiting electrons in their resting state. Electrons are usually at the lowest energy level. By absorbing energy in the form of a photon, an electron will move to an orbit at a greater distance from the nucleus this represents an excited unstable state, the tendency of which is to revert to the resting position by dropping back to their original orbit. A photo of energy is released during this process which is called spontaneous emission of radiation. Stimulated emission course when an already excited electron absorbs a further photon of equal energy and then reverts to the resting orbit.In this process to photons are released, both with the wavelength, face, and direction of the absorbs photon. the energy which is required for the process is provided to a laser by an external power source. each time the process is repeated, the number of photons within the laser cavity increases. The significance of this is that stimulated emission becomes more probable and light amplification more significant. In addition to intense brightness laser light differs from light emitted by conventional light source in that it has the following characters.1. Mono chromaticity, 2. Coherence,3 collimation. 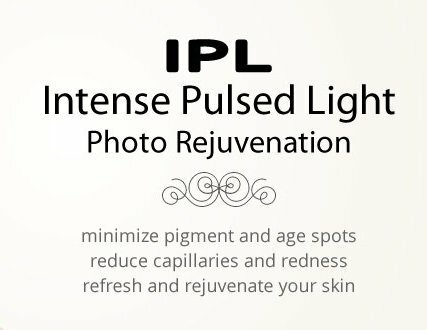 Photo Rejuvenation is a non-ablative process using low fluency IPL to rejuvenate the facial skin as well as the skin on the neck and breast. Benign vascular lesions:- Telangiectasias, Phlebectasia, Rosacea, Diffuse redness. Photo-aging, Skin texture, increase Pore size, Wrinkles. The IPL Target chromophore is Haemoglobin which absorbed light. Light is transformed into heat. Heat is conducted to the smallest and most superficial vessel walls causing destruction of the vessel if 70º C > 1 ms. The vessels also release growth factors which stimulate collagen production in the dermis. These give rise to reduction in wrinkles and reduction in pore size. Usual methods of hair removal are Waxing, Tweezing, Shaving, Chemical depilatories, and Electrolysis. These all methods have one or another disadvantage. These are Time consuming, Painful, Slow, Messy and Quick re-growth. But hair removal with the laser is much more superior as compared to above all. The laser beam is absorbed by pigments of hair in the form of heat. This heat is transmitted to root of hair and hair follicle is destroyed. There are various types of laser and light source are being used these are Alexandrite @ 755 nm, Diode @ 800 nm, Optically Filtered Ruby @ 694 nm, Light Source, Long Pulse Nd: YAG @ 1064 nm. 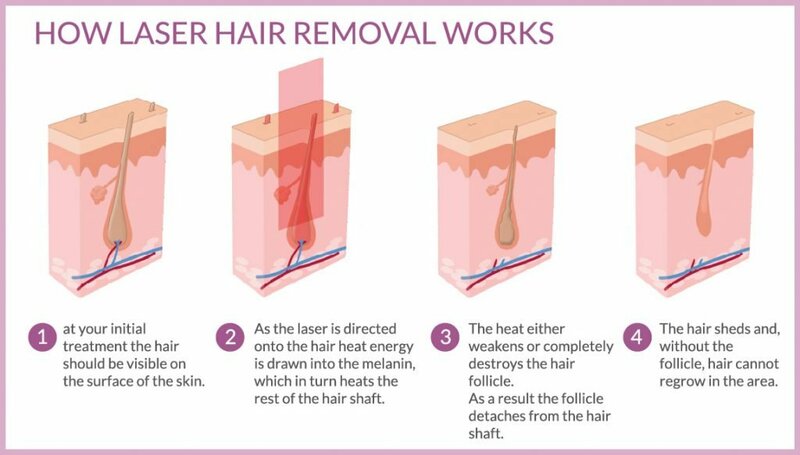 Laser beam only destroys hair root in which hair growth is in the anagen phase.At a given time all hair is not in anagen, that is why for hair removal multiple sittings are needed. It is important not to remove hair by waxing, threading, bleaching, or hair removal cream at least 3 weeks before laser treatment. The hair can be safely removed from anywhere from the body with very minimum pain. Pain during hair removal is like a pinch for the friction of seconds even if this much is not tolerable to a particular patient then hair removal can be done using local anesthetic cream application. Black and thick hair respond very well as compared to thin brown hair. White hairs do not respond with Laser, as these do not contain pigment in them. The hair destruction is permanent but hair reduction may not be 100 %. Usually, 70 to 90 % hair reduction takes place. The remaining hairs are usually thin, sparse, brown or white hair. Patients with the endocrinal disease, cancer, immune compromise and heart patient, should be treated with cautions. Same applies to females taking oral contraceptive pills. Before going to Laser treatment person shall ask all his or her quarries and shall tell everything about them. They must also ask and discuss the type of Laser, make of machine and experience of laser surgeon. About 10% of the world’s population is struggling with Acne right now and spending huge amounts of money trying to get rid of their Acne problems. 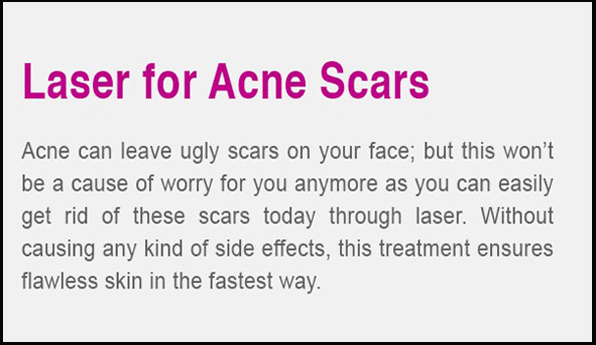 Normally Acne attacks people between 15 to 35 years of age. Acne is causing all sorts of psycho-social problems such as low self-esteem which can affect the individuals through their whole life. Topical Treatment 1 month prior or at least from the start of Light Plus IPL treatment the patients apply adapalene cream or gel on the acne affected area every evening. Adapalene has to be prescribed by a doctor. Adapalene makes the skin thinner and thereby helps to open the sebaceous ducts enabling secretion of oil and fatty acids produced by the sebaceous glands. The IPL Target chromophore is Haemoglobin which absorbed light. Light is transformed into heat. Heat is conducted to the smallest and most superficial vessel walls causing the destruction of the vessel if 70º C > 1 ms. 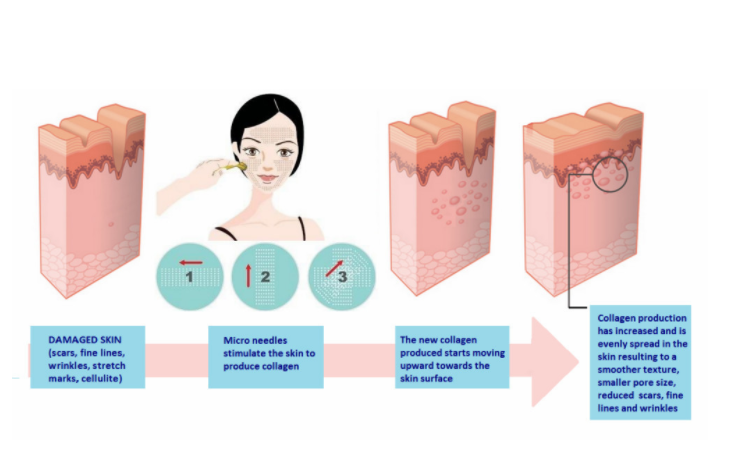 The vessels also release growth factors which stimulate collagen production in the dermis. These give rise to the reduction in wrinkles and reduction in pore size.